Apart from such traditional devices as a TV set or PC, mobile devices such as smartphones and tablets have been recently becoming increasingly popular. Although properly chosen online content can positively affect children’s development, untimely and too intensive use of electronic devices can be significantly harmful for them. Human brain develops the most intensively in the first years of life. For this development, a child needs to experience the world with all its senses – to see, feel, hear, and touch it. Limiting child’s activities and type of stimuli can negatively affect the development of brain’s neural structures. A child’s brain needs also intensive contacts with other people. Neither TV nor computer will replace talking with parents or other children, playing and reading books together. It is not enough to just be with a child. We need to interact, while devoting it our maximum attention. Research increasingly shows that intensive use of electronic media in the first years of child’s life has a negative impact on the quality of its sleep, memory, ability to concentrate, read with understanding or write in a legible manner. Children under the age of two should not have any contact with screen devices, including tablets and smartphones. 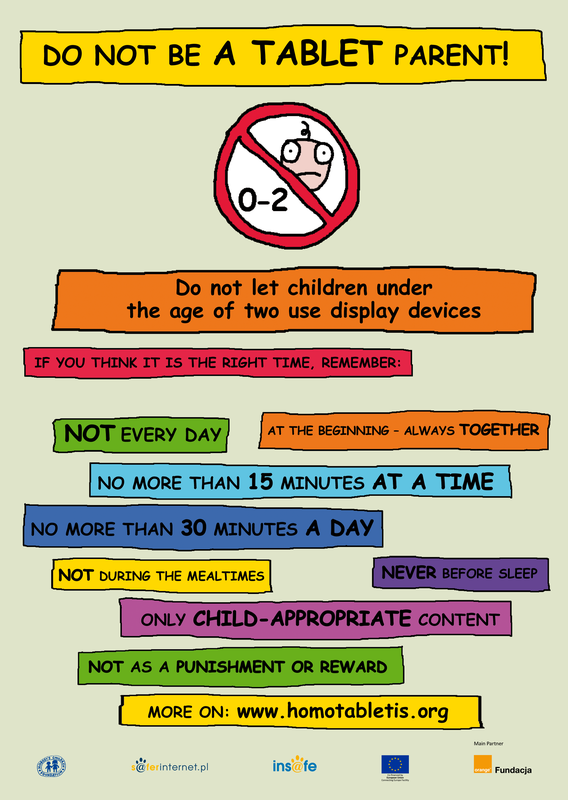 Sharing electronic devices with children aged 3-6 should be a well -considered decision including a series of rules. Children should not use mobile devices every day. Children should not use them more than 15-20 minutes at a time, and no longer than half an hour a day. Children should access only safe and positive content, adjusted to their age. Parents should accompany their child during use of mobile devices, explain to them what they see on a screen and use this time spent together to interact. Children should not be allowed to use mobile devices before sleep. Radiation emitted by screens of tablets and smartphones negatively affects falling asleep and sleep quality. Use of mobile devices should not be treated as a reward or punishment. This makes these devices more attractive for children and strengthens their attachment to them. Mobile devices should not be used to motivate children to eat, toilet train etc. With benefit for a child? Improper use of electronic media can be dangerous for children. However, use of mobile devices by children aged 3-6 may positively affect their social, moral and cognitive development. You provide your child with access only to safe and useful contents, adjusted to its age. Before sharing your smartphone or tablet with your child, secure it properly. To this end, you can use parental control apps available on the market. They let their users filter the content, control child’s online time and activity, etc. They may be found in online stores suitable for a given operating system. However, start from securing a device against a child’s access by configuring an access code that should be kept secret from a child. The next step is to properly adjust settings of a given device. For Android devices, select the option Parental Control in the device settings and properly configure the settings concerning the content limitations. They may concern apps and games, where a parent defines a child’s age, as well as purchases of music in Google Play store – here a parent can block the access to compositions including vulgarisms. Owners of iOS mobile devices (iPad, iPhone) can use the function Limitations in general settings of a device. Here you can decide on a limited access to the selected content. A parent can define age limitations concerning displayed films or used software. Here you can also block a child’s access to music, video clips and podcasts “for adults”. In turn, holders of Windows Phone-powered devices can use the My Family feature in the service Family Safety by Microsoft. Thanks to its configuration, a parent can decide whether it enables its child to download games and apps or whether download of some type of products must be blocked. Under the feature Family Filter a parent can start the option Game Classification Filter enabling to choose games adjusted to a child’s age. What to do when we have already accustomed a one-year or two-year-old child to using a smartphone and are not able to take care of it without providing these devices? How to respond to situations when older children use mobile devices in a disturbing way? tablet and smartphone being leading subjects discussed by a child. For a preschool child, online activities should be only an addition to attractive forms of spending time without electronic devices. Parents should agree with each other on the rules of a child’s use of mobile devices and apply them consistently. If situation gets out of control, assistance of a child psychologist can be sought and parents can learn how to spend quality time with their children, how to enforce boundaries and how to help them regulate their emotions.